With most nail art, I go through phases. For a while I love anything with stripes, or dots, then I move on to chevron, or perhaps leopard print. I incorporate the current favourite into most manicures I do, relishing all the different ways to do it; creeping up the side, covering the whole nail, different colours - the possibilities are endless! After weeks, or sometimes months of this, I get a feeling not dissimilar to the sudden hatred you get when you've listened to your favourite song too many times. I go completely off it; it's boring, it's easy, it's cliché. I refuse for do it for months at a time, until the wheel turns full circle and suddenly it's back in full force. Today's nail art, however, is not one of those designs. I have a handful of designs that I never seem to tire of, and they are the detailed ones. I always love doing Disney nail art, My Little Pony nail art, Game of Thrones nail art and anything else that requires a lot more patience and creativity. I've previously done Rainbow Dash and a Halloween pony, and after it being requested over and over, I decided to do Pinkie Pie. Since Christmas is only five days away though, I added in some Christmas lights to make it a bit more festive! Here's the tutorial! Please subscribe to my channel, I generally upload a new video every Friday. Literary Lacquers - Anne With An "E"
If you know anything about My Little Pony, you'll have seen that they've changed their look a few times. I'm not sure about all the different stages - I saw in a comment somewhere that there are five? - and there's quite a distinct change between the original and the current cartoon. Personally, I think the old one was ten times better, so I based my Pinkie Pie off how she used to look. You can see the difference between the old and new in this video, which I used as inspiration. I'm really happy with how these Christmas lights came out - much better than last year's! I was inspired by this picture of some Christmas light decals. I was quite determined to get some decent pictures of these nails, and while experimenting I tried posting with a flower. Because, you know, that's cool. Hope you like these! They'll be my last Christmas tutorial of 2014, but I've got some exciting nails planned that'll be coming in the next few weeks. 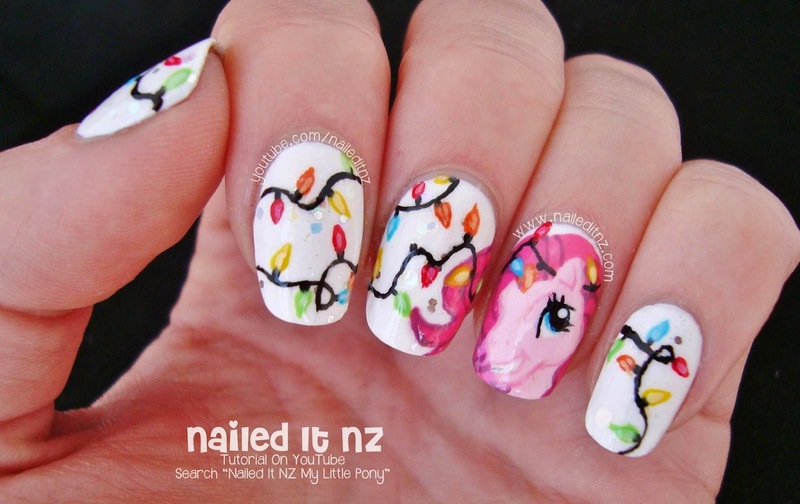 Again, you can see my Rainbow Dash and a Halloween pony nails on my YouTube channel.